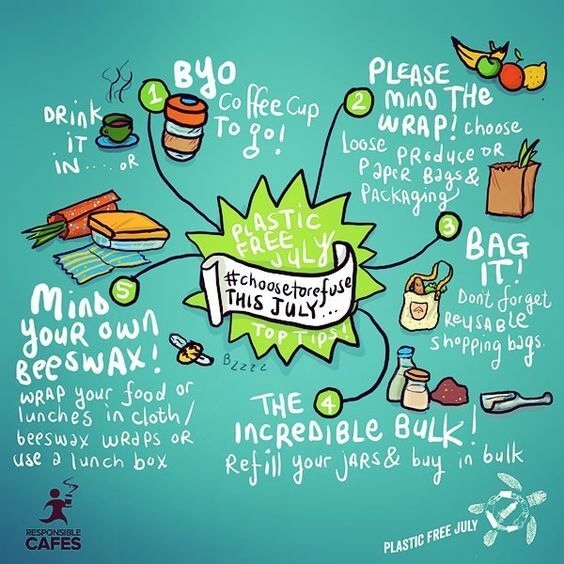 This lovely graphic about plastic-free options is by catfishcreative on Instagram. It’s July, and if you’ve been reading this blog for more than a year you know what this means: The re-surfacing of my obsession to cut as much single-use plastic and plastic in general out of my life. While I’m always trying to live my most environmentally friendly life ideals tend to get thrown under the bus of everyday business and comfort. Each July I’m reminded of where I want to be with my consumption habits, be it groceries, toiletries or even the tiny things I treat myself with, and I can try again to make the world a little bit cleaner, a little bit better, and a little more friendly for humans and planet alike. I still know what used to be my biggest challenge last year: pasta. It always comes in plastic packaging at the supermarket, and back then I didn’t have a bike to regularly go to the one place in town I know of where I can get it packaging-free. Now I don’t only have a bike but also a friend who works there, so that’s a bonus when I actually get there! What I’m saying is that motivators are important, this might be this year’s biggest subtopic for me, too. And of course it’s not only about plastic, it’s about aluminium, about fast fashion, about litter in general. With general crafting as a hobby it’s sometimes difficult to find alternatives and workarounds, but I’m rather positive I can still make my crafting habits less prone to cause a full bin. One thing to always remember, though, when thinking about living a plastic-free life is that in our world it is pretty much impossible to get rid of the stuff completely. Some things won’t come without, and some of these things we need – just think of medication blister packs, your phone, your computer. There is no shame in not living the plastic-free-est life ever. There is no shame in still buying your favourite sweets even though they come wrapped in single-use plastic, especially not if they make you truly happy. Even a tiny effort goes a long way, and don’t let anyone tell you different. Even if you get a reusable to-go cup and that’s it – that’s one person’s worth less of single use cups, one person’s worth less of trees that are felled only for a cup of coffee, one person’s worth less of lids thrown in the bin afterwards. Tiny efforts are what this is about, because a lot of tiny efforts make a couple of big ones. And you are part of that. Also, there are a TON of cute reusable cup designs out there.